Colombian environmental authorities have reported a huge shark massacre in the Malpelo wildlife sanctuary in Colombia’s Pacific waters, where as many as 2,000 hammerhead, Galápagos and silky sharks may have been slaughtered for their fins. Sandra Bessudo, the Colombian president’s top adviser on environmental issues, said a team of divers who were studying sharks in the region reported the mass killing in the waters surrounding the rock-island known as Malpelo, some 500 kilometres from the mainland. “I received a report, which is really unbelievable, from one of the divers who came from Russia to observe the large concentrations of sharks in Malpelo. They saw a large number of fishing trawlers entering the zone illegally,” Bessudo said. The divers counted a total of 10 fishing boats, which all were flying the Costa Rican flag. “When the divers dove, they started finding a large number of animals without their fins. They didn’t see any alive,” she said. 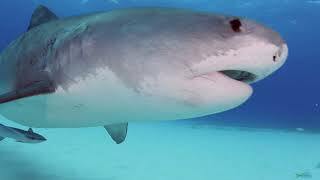 One of the divers provided a video that shows the finless bodies of dead sharks on the ocean floor. Calculating an average of 200 sharks per boat, “our estimates are that as many as 2,000 sharks may have been killed,” Bessudo said. The sanctuary covers 8,570 square kilometres of marine environment that provides a habitat for threatened marine species – in particular sharks. Divers have reported sightings of schools of more than 200 hammerhead sharks and as many as 1,000 silky sharks in the protected waters, one of the few areas in the world where sightings of short-nosed ragged-toothed shark, known locally as the “Malpelo monster,” have been confirmed. In 2006 Unesco included the park on its list of World Heritage sites. But the high concentration of sharks in Malpelo and the remoteness of the marine sanctuary draws illegal fishing boats from nearby nations which trap the sharks, strip them of their fins, and throw them back into the water. Shark fin soup, considered a delicacy of Chinese cuisine, can fetch £63 per bowl in a Hong Kong restaurant. Colombia’s navy sporadically patrols the waters and maintains a small outpost on the 1.2 square metre island, which is 36 hours from the nearest port. At the time of the reported shark finnings, however, no navy ships were nearby. At the same time, Colombia’s foreign ministry took up the issue with the Costa Rican government, which vowed to co-operate to help stop the practice by ships registered under its flag. In a communiqué, the Costa Rican foreign ministry said it “energetically condemns” the reported finning and said it would prosecute if the participation of Costa Rican flagged ships were involved. At least three of the ships were identified by their names: the Marco Antonio, the Jefferson and the Papante. • This article was amended on Wednesday 19 October. The original mentioned “hammerhead, Galápagos and whale sharks”, and “the Marco Antonio, the Jefferson and the Andy”. These errors have been corrected.